Just 2 kilometres away from Kannur town, the conveniently located Payyambalam beach is a large stretch of golden sand frilled by coconut greenery. 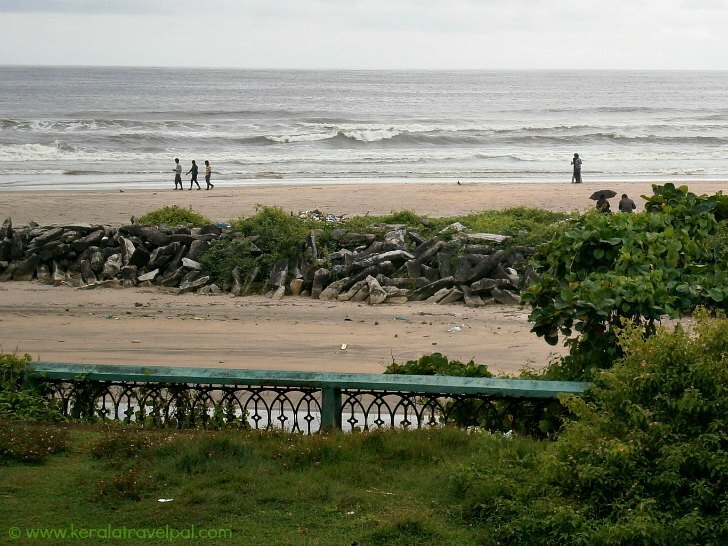 This favorite hangout for locals is the best known of all Kannur beaches. Entrance to the beach is a bit odd. A walking bridge over a small canal is the main access. Immediately after the bridge, on the right side is an area where monuments are erected on tiled floor. These monuments commemorate the lives of political leaders who belonged to Kannur. You can also see a burial place of Thiyya community, just above the beach. Payyambalam beach is long, wide and quite even. Extending about 4 kms, it ticks most of the boxes for a great beach, even though a lot need to be done to translate potential to reality. A cliff forms a natural border on one side.On top of the cliff is the beach garden. The beach garden has a couple of interesting structures such as the statue of Mother and Child. Nevertheless, the garden in general needs a bit of a touch up. Mother and child is done by Kanai Kunhiraman, one of the leading sculptures in Kerala. Not too far away is the beach restaurant Naura Cafeteria. Kannur, in ancient times, was known by the name Naura. Payyambalam beach appeared in several South Indian feature films. The Tamil movie Alai Payude, directed by Mani Ratnam, Worldspace ad by A.R.Rahman, and many more have scenes filmed here. Thanks to the attention of local authorities, the beach is kept clean. The only exception is the entrance where horse riding is done. Waste from horses is often overlooked and creates a bad first impression about the beach. Usually the beach is not so crowded. However, it can get busy during evenings and weekends. The good news is that the fine sandy stretch is quite long that you can always find secluded spots. The beach is good for swimming and sunbathing. However, it is one of those places that may make you feel to confine to local dressing code. Water skiing, para sailing and boat rides are conducted by the Tourism Council. The charges are nominal. These activities are scaled back during rainy season when the sea is rough. Payyambalam beach may take up an hour or two. If you want to spend several days on the beach, try Ezhara beach strip. Meekunnu, kizhunna, Thottada, Muzhappilangad......there is no scarcity of beaches. Payyambalam is easy to reach. Although distance is walkable ( a long walk though), the best option is to hire an auto-rickshaw from Kannur town. 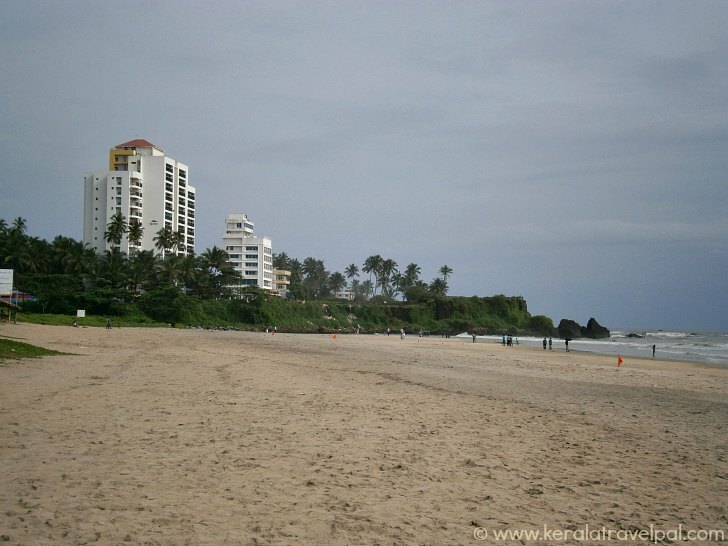 Food Options : Naura Cafeteria is located near the beach. Several restaurants in Kannur town. Accommodation Options : Hotels, lodges and home stays at Kannur. Best time to visit : October to May. Can be visited throughout the year although monsoon can spoil some fun during Jun-Aug. Nearby Attractions : Dharmadam Island, Andalur Kaavu, Thalasseri fort, Beaches of Kizhunna, Ezhara, Kadalai and Thottada, Arakkal Museum, Mappila bay, Meenkunnu Beach, Kannur town( shpopping & food), Parassinikkadavu Muthappan Temple, Snake Park, Vismaya, Muzhappilangad drive-in-beach and Sea View Park.